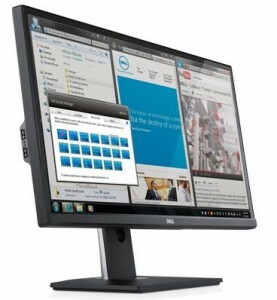 Dell Home offers the unique Dell UltraSharp U2913WM 29” Monitor for a low $479.99 with free shipping after 2 coupon codes: "FNR?FNNWG4T1FD" and "W7HWC5Q9S4V6VH". Exp 6/13 6am CDT or sooner; limited quantities. $582 at Amazon. This models features a unique 21:9 aspect ratio ultra-widescreen image. It features an upgrade of the In-Plane Switching (IPS) panel to AH-IPS (Advanced High Performance) instead of the more common P-IPS (Professional) panel. In English, this gives the monitor better color fidelity, a wider angle if view, and a large palette of colors to render. This type of monitor is best suited for an environment with lots of glare/florescent lighting. The model got 4 of 5 stars at PC Mag with editors giving it an "excellent" rating. They listed the positives as "Great color quality. Very good grayscale performance. Generous port selection." (Includes HDMI, DisplayPort 1.2, Mini DisplayPort, DVI and VGA, along with a 4-port USB 3.0 hub.) Their only negative criticisms were "Vertical viewing angle could be better. No speakers. Mediocre motion handling." For people serious about the quality of the images they work with and who prefer a very large, ultra-wide screen, this model makes a great choice.